After losing her mother to depression-induced suicide, Leigh visits her grandparents in Taiwan and tries to unravel the mystery of her mother, the bird. Pan writes with eloquent, lyrical style that creates a poignant book. You will feel every emotion Leigh feels and be able to picture everything she thinks and does with clarity. Overall a beautiful and highly recommended read. The Astonishing Color of After is a heartfelt, gorgeous story about grief, heritage, and family. The story follows Leigh Chen Sanders, who, after her mother's suicide, visits Taiwan to meet her grandparents for the first time and try to find the bird she believes is her mother. 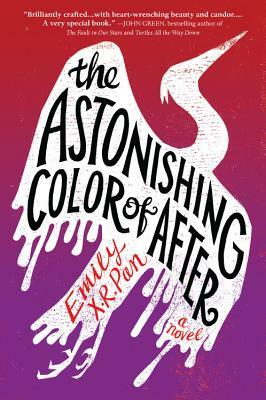 With contemporary mystery that will appeal to fans of Love and Gelato, lyrical writing that will appeal to fans of Maggie Stiefvater, and a heart all its own, The Astonishing Color of After is a smashing debut. In The Astonishing Color of After, a young girl follows the path of her family’s history to learn the truth behind her mother’s suicide. The novel examines depression with equal parts sympathy and honesty, and Pan’s use of both the present and the past to tell the story gives new depth to such a complicated issue. Because of its sensitive content, The Astonishing Color of After may not appeal to some audiences, but those who read it will find an intimate exploration of how memory can both devastate us and give us hope.